The self-order kiosks replace one cashier. Photo courtesy of UFood Grill. Patrons at the newly opened UFood Grill in Owings Mills, Maryland, won’t be forgotten. They can order at a self-serve kiosk that will remember them for future visits, thanks to facial recognition. 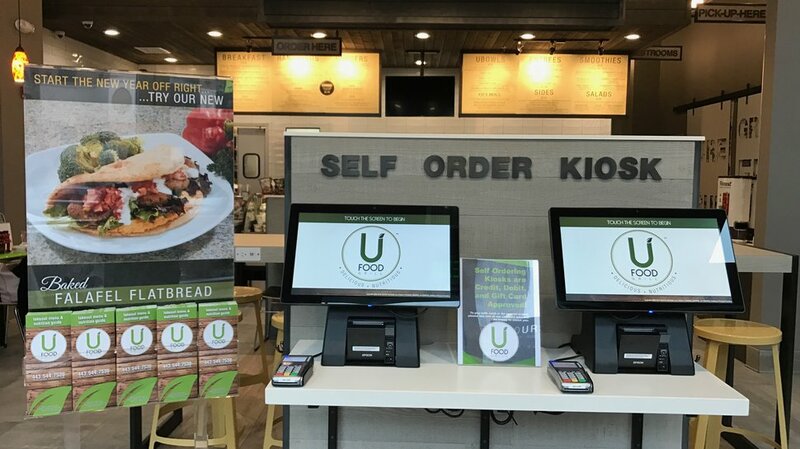 The kiosk is the technological highlight of the fast casual chain’s first stand-alone street location, said Samantha Rincione, UFood Grill’s vice president of franchise development. Customers can choose to order at one of the two kiosks or may place their orders at the traditional cashier counter. Kiosk users are asked if they would like to add their phone number or have a photo taken to make future orders easier. They can order and pay in less than 10 seconds. Once the order is ready, the servers call out the customer by name to pick up their order at the counter. Servers also take orders to customers. “Every quick serve and fast casual restaurant can benefit from facial recognition,” said Tommy Woycik, president of Nextep, the company that developed the technology. “While initially using it indoors, we will soon be piloting at our touchscreen drive-thru locations. Other benefits include increased order accuracy, reduced food waste and increased guest satisfaction, Woycik said. The two Nextep kiosks at Ufood, which replace one cashier, help the chain upsell by asking customers if they’d like an add on. It also provides ingredient information, saving both the customer and the staff time asking and answering questions, Woycik said. The UFood kiosks not only make it easier for customers to order, they also help employees manage operations by offering a user-friendly POS experience and a variety of other capabilities, Rincione said. “If you’re a vegetarian and you want the vegetarian option, the cashier doesn’t have to turn to the manager and say, ‘Is this vegetarian?’ or pull out a menu,” she said. The manager can also take inventory using either the POS system or the kiosk. It even displays pictures, Rincione said. “The camera is only turned on if they request to either store an order or look up previous orders. It is important to respect the privacy of guests that don’t want to use this time-saving feature,” he said. Steve Goldberg, a forensic psychiatrist who owns the Owings Mills franchise with his wife, Lana, said his customers seem to be on board with the technology, He admitted, however, that he wasn’t an initial fan of the idea. While some people are wary of the facial recognition feature, Goldberg said customer reaction has been mostly positive. In the first week, for example, one-third of the customers ordered at the kiosks, but Goldberg thinks more will use them as they become familiar with the restaurant. He has already noticed that repeat customers are using the kiosks. Rincione said the kiosks at the Maryland restaurant are just the beginning. The company plans to include kiosks in all new locations, which include two company-owned street locations on Long Island this year. “The future is self-ordering and online ordering,” she said.